The article below is my round-up of sessions from the recent TESL Canada conference in Lake Louise. It appeared in the TESL Nova Scotia newsletter. This was a very participatory workshop where we brainstormed together with the presenters to come up with tips and techniques for developing seven non-linguistic academic behaviours (time management, self-efficacy, participation in seminars, collaboration, academic honesty, respectful communication, individual responsibility for learning) to complement the linguistic content of our EAP classes. This talk fell more under the umbrella of applied linguistics rather than classroom practice, which was a nice counterpoint to a lot of a sessions at TESL Canada. It was an interesting demonstration of how we tend to describe academic writing as “complex”, although it’s not complex in the way we general define the term: in terms of frequency of dependent clauses. Academic English is complex in terms of a high frequency of dependent phrases, while non-academic discourse which tends to have a higher incidence of dependent clauses. In very simple terms, academic discourse is focused on the noun and complex noun phrases, as opposed to dependent clauses built around verbs. He explored these definitions of complexity across disciplines, and over time. He didn’t delve too far into the implications for teaching and materials development though it was a lot of food for thought. This wasn’t a specifically EAP-focused talk, but since many EAP teachers draw on task-based language teaching (TBLT), it was quite relevant to our interests. This opening keynote presentation was a nice review of the history, principles, and essential elements of TBLT, with some participation as demonstration. In this talk the presenters shared the results of some recent research they’ve done where they interviewed graduates of their EAP program to see how well the content of the EAP courses aligned with the language demands of their first years of undergraduate study. It was very interesting to hear which areas aligned (group work, writing) and which areas didn’t (reading, lack of informal speaking, assessment style) and those present had a very lively discussion as to why these misalignments may have occurred and what was to be done about it. This type of research should be an important part of the systematic review of any EAP course. This was a practical talk, in which the presenter drew on the Grammar and Beyond series that she authored to give lots of ideas for activities for EAP writing and grammar that were informed by corpora and grounded in real language use. One of the highlights of the conference was this talk by John Sivell, a faculty member at Brock University. His talk revolved around the assertion that the act of paraphrasing is a substantial linguistic, cognitive, academic and cultural challenge. However, on most university campuses, despite the fact that paraphrasing is a major obstacle for both English L1 and L2 speakers, the teaching and learning of this skills is relegated to the sidelines—an online course, writing centres or in EAP courses with crowded curricula. The session ended with both the presenter and the attendees sharing strategies, tips and ideas for anti-plagiarism instruction. Yesterday was one of two conferences TESL NS will hold in 2015. Our small provincial teachers’ association only has somewhere around 150-200 members but in the 3.5 years I’ve been a member it’s been growing rapidly, not just in membership numbers but in range and scope of activities and vibrancy. It’s an exciting group to be a part of. The TESL NS conferences are fun on a variety of levels. Socially, it’s fun to catch up with members of the tight-knit ESL community in the province, and the food is always AMAZING (thanks to the Halifax Immigrant Women’s Catering Group). And then there are the talks! The English language teaching profession in the province of Nova Scotia has a very different make up than provinces like Ontario or BC. While in those provinces you have a combination of settlement English (due to high immigration numbers), general ESL (those cities being popular language tourism destinations) as well as EAP, Nova Scotia has a different landscape. The immigration and language tourism numbers are much lower in Nova Scotia, but we have a very high number of universities given the overall population, which means that a high percentage of English teachers in the province teach EAP, which in turn means lots of presentations at our conferences centre on the EAP teaching context. Yesterday I saw three sessions. Kris Mitchell gave a talk on Natural Semantic Metalanguage, which was really interesting and relevant for any teacher who has struggled to define words for their students in class or wrestled with students’ use of sub-par dictionaries. David Packer made the case for the paragraph as the unit of meaning (as opposed to the sentence). He got us going with a lively discussion as to the role of creativity in the teaching of paraphrasing and paragraph writing. Finally, Tony Rusinak gave a report on his attendance at TESOL 2015 and shared his take on current topics and trends in ELT for those of us who couldn’t make it to Toronto in March. This year’s big fall conference will be held in mid November. 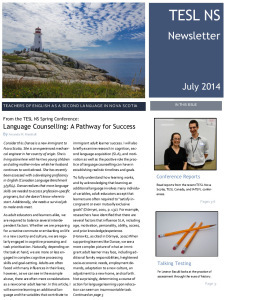 The most recent edition of the TESL Nova Scotia newsletter was released last week! This one is most likely my last as editor, at least for the time being. It’s been lot of work, but a lot of fun putting this magazine together and encouraging my teacher friends and colleagues to contribute. Some were already accomplished writers while other took a bit more nudging. I think it’s the adult educator in me that loves to see people push their boundaries and try their hand at a new territory within their professional practice. As I start my doctoral studies part time, I’m hoping to hand the editing duties for the publication off to a talented colleague and stay on for a bit of layout and a contribution from time to time. I’ve mentioned before that I have been the editor of the TESL Nova Scotia newsletter since November of last year. The July issue has just come out and can be downloaded here. Now three issues in, I’m getting the hang of the editor role–timing of submissions, setting up and using layout software, working with a copy editor, sourcing photos. What’s been interesting in reviving a defunct publication is the content. I want to produce a publication that’s interesting and relevant, and I also want to encourage educators from a wide variety of contexts and backgrounds around the province to submit. As the newsletter hasn’t been published for a while, it’s not on anyone’s radar, so it’s taken quite a bit of personal solicitation and encouragement/convincing. Hopefully ground is being laid for the future of the newsletter. My adventures in editing continue! 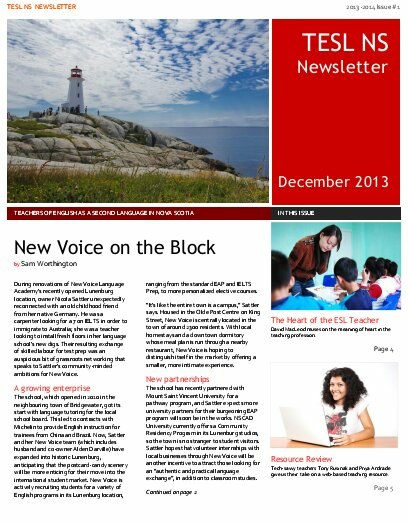 The March 2014 issue of the TESL NS newsletter hits the web today. Click here to download it from teslns.com. I was recently elected editor of the TESL Nova Scotia newsletter for the coming year, and last week the first issue was published. The newsletter had been more or less defunct for the last few years, which meant that putting together this issue was working off of a blank slate, which has its benefits as well as its drawbacks. It’s also my first time in the role of editor, which has its own learning curve, meaning I have gotten to practice the gospel of lifelong learning I preach to my students on a day-to-day basis. My tweeting and blogging had slowed to a standstill leading up the first issue coming out, (I only have so much free time!) and so I’m glad things are now back to normal…until the next issue is published in March!